In 2012, World Rare Disease Day falls on a truly RARE day, February 29. The Global Genes Project will be working with local businesses schools, sports teams, places of worship, parent advocates, etc. to join in the ‘Wear that you Care’ campaign of support. The jean ribbon has become a unifying symbol for hope in the RARE disease community and building awareness is easy! Wear Jeans, Help bring Kids Hope. 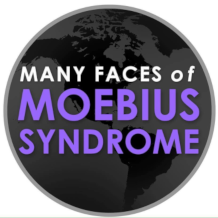 Log on to www.globalgenesproject.org or more information on how you can get involved to build awareness for RARE disease and The Many Faces of Moebius Syndrome. It’s easy and fun to make a difference for this community in need! Our goal is to have One Million supporters pledge to wear jeans on February 29 2012. 24 January is not only the birth date of Paul Jullius Mobius, but it also gives rise to the annual celebration of an Awareness Day for children / adults suffering from Moebius Syndrome. This was the day our lives were put on course -part of the same journey, with Paul Mobius as the Pilot, we the passengers. There once was a boy who never smiled. His name was Matt Downer. But all the kids called him “Mad Downer,” because they said he always looked mad. He never smiled at his mother or father. He never smiled to his friends. He never smiled when he was happy. And he never, never smiled when he poised for a picture. He just never smiled. He even hated the very idea of smiling. When his mother or father tried to get him to smile, Matt would shout “No!” When Matt’s friends asked him why he never smiled, he said, “Smiling is for losers. Why should I smile?” He never seemed to care that not smiling was making everyone around him sad. Know how sometimes you get the feeling that you can’t do something your friends or classmates can do? I feel that way every day because I can’t smile. Let me explain. I was born with Moebius Syndrome which was caused by a loss of blood when I was a developing baby. That loss of blood caused the nerves for my face to form the wrong way, and because of it, I cannot smile or move my lower lip very well. When you’re a teenager, or a grown up, you can’t get Moebius Syndrome, you have to be born with it. When you are born with Moebius Syndrome you could have one or more of the following features: clubbed feet, missing fingers and/or toes, crossed eyes, and you cannot smile.